This year, ISABS conference was very successful for our group. After I gave an invited lecture on Monday 19th, Professor Tamas Ordog, the ISABS program director, invited me to come to Mayo Clinics and deliver a lecture about the CRISPR/Cas9 epigenetic editing tools and its potential use in personalised medicine. 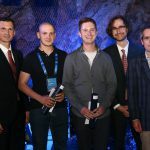 Also, Goran and Vlade took the Young Scientist Award for the best poster on behalf of the whole group of colleagues involved in the design and construction of our dCas9-DNMT3A and dCas9-TET1 tools. Congratulations to all !!! This entry was posted in Nekategorizirano by vZoldos. Bookmark the permalink.